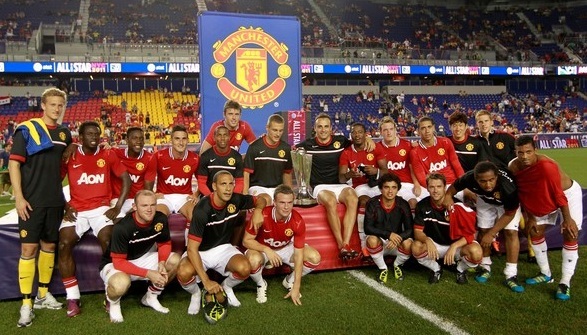 It ended up being a pretty easy 4-0 win for Manchester United over the MLS All-Star team in New Jersey tonight. Anderson, Park, Berbatov and Welbeck were the players who got the goals. The All-Stars started off well and had some chances, but they just couldn’t handle the creative play of United. Realistically, it is extremely tough for a team of players to come together and compete with one of the best teams in the world. The result is a tough one to take for MLS, and in my opinion it might be the right time to open up an East vs West MLS game! By the way, if you liked the MLS All-Star jersey, they are available to buy. Thierry Henry: The most noticeable change was that of Henry, who just made the unexpected move from Reebok to Puma, with the King Finale his preferred choice! David Beckham: Becks was unlucky not to get on the score sheet while wearing his personalized Gold Adidas adiPower Predator. Wayne Rooney: I personally think Rooney’s Metallic Blue Nike T90 Laser III were one of the best looking on the pitch. Rio Ferdinand was also wearing them. Ji Sung Park: He got the MVP award, and without a doubt, his Nike Tiempo IV Elite’s were the fan favorite. Patrice Evra and several other players also wore the Tiempo range. Dimitar Berbatov: Berba was wearing the classic Black version of the Adidas adiPower Predator – can’t wait for them to be released in the US!! Omar Cummings: If you want a pair of boots that stand out, wear the Puma V1.11 like Cummings did. You couldn’t miss them on the field!